First of all, you should know I am writing this article early on the morning of September 30th, several hours before the U.S. government is set to shut down due to lack of funding. So by the time you read this, either Congress will remain in gridlock, or, a last minute bill was passed to fund the government for a few more days. Basically the Senate and the House are gridlocked, and neither are willing to compromise on passing a stop-gap spending bill to fund the government for a few more weeks. The Republicans are using Obamacare as leverage, asking for a one year extension for implementation before they will sign any agreement. The Democrats are holding their ground, saying they won’t compromise this legislation in order to pass the stop-gap legislation. The Republican constituents say the Democrats are being stubborn. The Democrat constituents are saying the Republicans are being stubborn. Great News!!! The Government is going to shut down tonight at midnight. If you read the headlines, the media propaganda machine will tell you this is a fiasco and should be averted at all costs. CNN claims the Republicans are destroying the nation and don’t care about the sick and needy. Fox News claims the Democrats have no fiscal responsibility and don’t understand anything about the budget. It is all fear based propaganda. Just check the source and their own motives. Let’s think about it rationally: Do we really need a government as big as the one we currently have? Is it really such a disaster if 800,000 government workers go on furlough? 1. Our tax dollars do not fund old and/or poor people on welfare. Our tax dollars service the debt 100%. Not a dime is spent on government functions, in terms of tax revenues. The government itself is funded by lines of credit. So when we raise the debt ceiling (which is what is being called for), we are essentially allowing ourselves to go further into debt. 2. 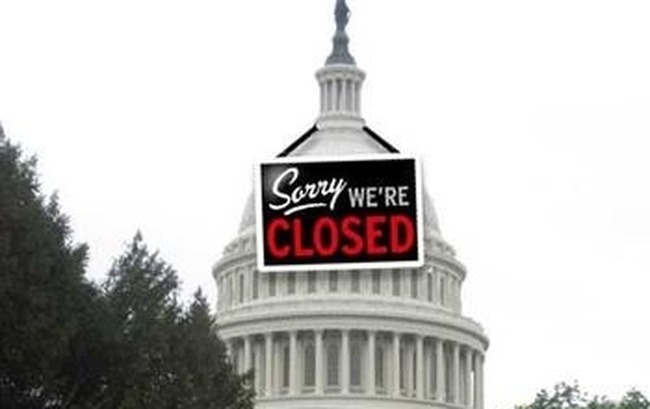 800,000 government employees on furlough. These 800,000 individuals hold what our government calls “non-essential” jobs. So basically, our government has admittedly created nearly one million jobs that aren’t even ESSENTIAL (i.e. not necessary). Keep in mind the Department of Defense (DoD) is the largest employer in the world with 3.2M workers. And that is just one part of the government. CNN claims that you won’t be able to go on vacation because all national parks will be closed. I find that a bit ironic considering those parks are theoretically owned by the citizens anyway. Why can’t I just go camping in Yosemite anyway? Does a bear sh!t in the woods if there isn’t a statist park ranger to smell it? Supposedly, all police will be paid in IOU’s if the government shuts down. The end result is that many may quit their jobs and do something else. Like maybe private security….hmmm….free market anyone? It seems the Bureau of Alcohol, Tobacco and Firearms (ATF) will be shut down as well. Do we really need this agency to begin with? Why is it we have selected politicians to be our morality police in the first place? How awful would it be if we actually made our own choices without the encumbrances of government with regards to our smoking, drinking and self-defense? According to news reports, IRS call centers would even shut down. Gasp….. Now that’s a tragedy…. The irony in all this is most Americans actually think they need the US government to exist. Ironic, yes. But ultimately it is just sad. As a thought exercise, imagine what it would be like if the government didn’t exist. Completely shut down. Permanently on furlough. What would your life look like? Would your day-to-day routine change? Sure, if you are a government worker or somehow sustain your life with government subsidies, you would need to make dramatic changes in your life. You may actually be forced to provide value to this world instead of exist solely as a parasite. Harsh words? You betcha. I am not saying all government workers are useless. Just that they are in essentially useless positions and draining the productive capacity of the country. Even their employer categorizes some of them as being “non-essential”, though. There are many smart people working for government. Imagine the world if those 800,000 furloughed government workers were forced to take private sector positions in the economy adding real value. Imagine the world where 50% of your earnings are not stolen from you in the form of taxation. You could use that additional wealth to invest in productive assets, create businesses, invent new technologies, or donate to charities that mean something to you. The common, albeit misunderstood, argument for government is that the free market needs those ‘checks and balances’ to offset rampant greed. For me, this is the most ironic of all arguments given the abject failure of the government to provide effective checks and balances; not only in its own primary functions of the three branches of government, but in holding their own charges accountable. If anything, government has facilitated the irrational interests of a few, foregoing the interests of the public, with no consequence. Greed is nothing more than an individual making choices in his own best interest. As Ayn Rand called it: rational self-interest. However greed, or rational self-interest, must be balanced by consequences. For example, if I greedily think that defrauding my clients is the quickest route to wealth, I am forgoing any thoughts about the consequences of those actions. It certainly isn’t a sustainable method of conducting business. In my business, it is in our best interest to develop long term relationships with clients. Those clients work with us for many years and even refer us to their friends. In the long run, the value of one client far exceeds what short term gain I could get from defrauding them. In this case I have balanced my rational self-interest with the consequences. I choose to do business the right way because it is best for me in the long term. However in government, there typically are no consequences. What are the consequences for an IRS agent who mistreats you and forces you to overpay your taxes from her own mistake? None. The agent wouldn’t lose her job, or even suffer a decline in income from this. As a matter of fact, you would need to work very hard and spend additional money to recoup your over paid taxes. What are the consequences for the policeman who uses a bit too much force at a traffic stop because he perceives you to be a threat? At worst he may be on paid leave for a couple of weeks. What were the consequences for the NSA employees caught last week spying on their girlfriends and ex-girlfriends using wire taps, reading emails, and video surveillance? At most a slap on the wrist. We could even go so far as to include the large banking system since it is really now just an extension of the US government and the Federal Reserve. What were the consequences for the fraudulent bankers in 2008-09? Not one single banker went to jail. The only company that really suffered was Lehman-Brothers. Any guess as to why? Hank Paulson, former CEO of Goldman Sachs – the largest competitor of Lehman-Brothers – just so happened to be Treasury Secretary at the time their demise was allowed. Indecently, Goldman Sachs was also in dire straits financially, but for some reason was not allowed to fail. Coincidence? I think not. The point here is the free market offers a near-perfect balance between rational self-interest and consequences unlike what exists today in government. Of course, I am a pragmatic thinker as well. I am not so naïve to think that anarchy can exist on a larger scale in today’s world. But certainly cutting back considerably, or even marginalizing the government to a great degree is not out of the question. Unless you want to live in the Amazon jungle living off fruits and berries, you will exist under various forms of government rule. The idea is to structure your life in such a way to minimize your dependency and thus your subservience to those masters. With today’s impending government shut down, it was just an interesting thought exercise that will hopefully expand your own thinking. Funny and true commentary on a sad and pitiful situation. I read this blog everytime I get an email. I truly enjoy reading your, personal articles. Thank you for your fresh view, and I sincerely wish others would be able to wake up, and see the world through your eyes! Thanks for the kind words Will. As I sit back and grin from ear to ear, and we are already at the Ninth Gate of Hell in our hand basket, and the emperor has no clothes at all nor the requisite intelligence; I can only laugh at the impending misery, which has been assiduously predicted ad infinitum, and wholeheartedly can say with glee—SEE, I TOLD YOU SO. And the merriment and mirth continue and will do so, unabated. You are right…they felt so secure in their jobs from 2007 to 2012 buying all their new grown-up toys with smug looks on their faces at the expense of everyone else in the REAL private sector. Do they still enjoy working for the gov /gov contractors now? They should quit (right now) and produce because their masters have told them they are non-essential. Who Exactly Are the Good Guys?